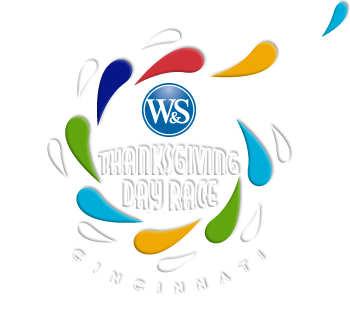 ﻿ 2018 W&S Thanksgiving Day 10K Run & Walk Newsletter #7 - RUN that by ME - All I ever wanted was everything! Western & Southern to Give Print to Every Runner! "The race is a celebration of health and happiness, and family and friends. It's about our beautiful city," said Cincinnati artist Holly Schapker." Schapker captured that beauty of Cincinnati in a colorful watercolor that dances off the paper. "I wanted to capture the power of being together and moving in the same direction — running and walking and dancing with purpose and passion through our beautiful city." "We were so happy with the painting that we wanted everyone to have the print as a gift," said John Barrett, CEO of Western & Southern, which is donating prints of Schapker's illustration to the first 10,000 people who register. "She truly captures the theme of this year's race — Be Beautiful Cincinnati — and we are honored to share her work with everyone." Over the river & through three cities, to the finish line we go. Let's turn running time into beautiful Cincinnati time. Register today and receive a gift like no other! Oh boy, you might want to hurry. Our hot sale ends on Friday with a small price increase on registration. Pullovers are still on sale! What are some diet DISASTERS people do before a race? "Eat your normal dinner, not a box of pasta and a family-size salad," says Kristen Deangelis, RD, from TriHealth. "You are running a 10K, not going across the country on foot. Eat just to fullness so you don't get indigestion or have trouble sleeping." "It will leave you feeling bloated and dilute your electrolytes -- minerals responsible for muscle contraction," says Deangelis. "Since the weather at race time will likely be cold, you won't dehydrate as quickly. Drink a cup or two of water before the start and at the finish. Take advantage of the water stop along the way as well." "A pre-race meal keeps your blood sugar steady and provides energy to finish your race strong," says Deangelis. "If you get too nervous to eat, wake up a few hours before so you can eat slowly. A small amount of carbohydrate and protein like banana and peanut butter, oatmeal, or a piece of toast with almond butter and apple slices are a few quick and easy options." "Do not try the new spicy sensation or you could be bolting for the bathroom instead of the finish line," says Deangelis. "Stick with your same meal routine for a few nights leading up to the race." Nobody is like you. All your lessons and experiences have created the beautiful and authentic person that you are today. You don't judge others, as you totally understand that everyone is doing the best they can with what they know. There "just is." Your perception = your experience = your growth. So many things can be achieved in one day. You know that there is enough abundance, success, and love for everyone in this world. You give with an open heart and an open mind. When you take care of yourself, it will support you. You have a family and friends. Lots of them. Probably more than you know. Opportunities to learn and grow are everywhere. Let's get started. And while we're at it, we can add to this list! Is your pillow helping or hurting your sleep? Contour pillows work best for most people. Your head rests in a depression in the center. Your neck rests on either a less elevated side when you're lying on your back or on a more elevated side when you're lying on your side. Natural latex offers support without heating you up like memory foam. By sleeping cooler, you sleep deeper. The feathers move when you do, so you wind up with no support, causing you pain. If you're in the habit of sleeping on your stomach, which isn't ideal, body and side pillows can improve your sleep posture. They provide the pressure on the stomach you've grown used to, while keeping you in a side-lying position. If you have a firmer mattress, you'll need a thicker pillow, because your shoulder won't sink into the mattress very much. If you have a memory foam mattress topper or a pillow-top mattress, you'll need a thinner pillow, because your shoulder will sink into the bed. What are the five types of mentors you need in your life? "This person is someone who's accumulated their wisdom through years of experience and who can provide insight into your industry so you can perfect your skills," says John Barrett, CEO of Western & Southern. "Turn to this person when you need advice about launching a new initiative or brainstorming what to do next." "This mentor is someone who will talk you up to others, and it's important to have one of these in your current workplace," says Alvin Roehr, CEO of the Roehr Agency. "Often, they can be connectors too, introducing you to useful people in your industry." "This is your work colleague who can talk you through projects, advise you in tough situations and hold you accountable," says Barrett. "It's a reciprocal relationship." "This person could be a friend or family member who is a confidante and a sounding board," says Roehr. "They can be particularly insightful when it comes to setting priorities, achieving work-life balance, and not losing sight of your values." "You can learn a lot from the people you are mentoring even though they may have fewer years in the workplace than you," says Barrett. "Engaging with the younger generation helps keep your perspective fresh and relevant."